In 2010, 23ccc was still in its infancy, but we were busy building relationships with local businesses that helped us to grow our own business, and we still work with many of those companies today. As part of that steep networking and relationship building time in our history, we were approached by East Hertford council, who were developing a theatre right in the centre of Hertford. Over the years, Castle Hall has changed its name, been refurbished and expanded its offerings, to be what we know today as the Hertford Theatre. Hertford Theatre now boasts not only an auditorium, but cinema facilities, a dance studio, meeting rooms, a gallery with exhibitions that change monthly, and a café to enjoy some refreshments while using the venue. Running alongside the growth of the theatre, there was also a need to make sure the business kept ahead of other entertainment venues, and that included how the public found them online. And that is where Hertford Theatre and 23ccc began forging a relationship that has lasted eight years and counting! ‘We are delighted to be working with 23ccc once again. We felt after 5 years it was time to refresh our website, especially as we had a new integrated Box office system and wanted to encourage people to visit the website and book on line. Our original brief was to design a holding website for Castle Hall – before it became known as Hertford Theatre – that would allow people to find out what’s on, and to give them a way to contact the theatre. This would be their first steps into the digital world, and it wouldn’t be long before a name change and building redevelopment moved the business forward. In 2013 we were asked to revisit the site again. The task this time was to bring the site right up to date in terms of the latest web designs and trends. Web development was going through a rapid change from the late 2000’s, with new and updated programming languages being adopted by developers. At the time, this was one of the most ambitious projects we had undertaken here at 23ccc. We were up for the challenge! There were advances in the coding world that we had not implemented in our previous developments. HTML5, CSS3 and jQuery were revolutionizing web development, allowing us to produce a site that acted differently to any other we had built before. Utilising these coding languages, we were able to build a website that improved the visitor experience. 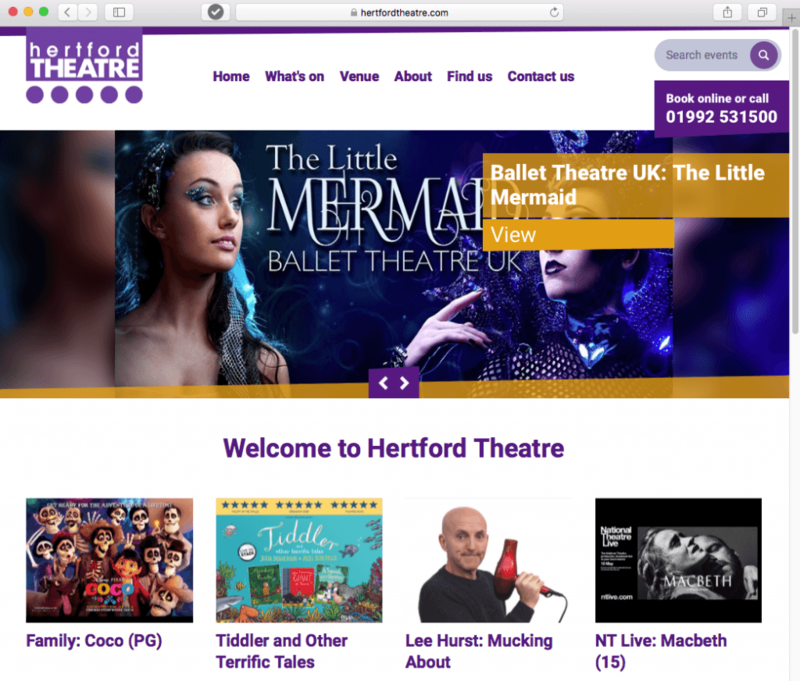 Improved navigation, page load times, and greater flexibility in what could be achieved with the design gave Hertford Theatre a website which was as state-of-the-art in its look as it was in its performance. As well as bringing the design up to date, we were able to integrate Hertford Theatres online box office system, providing customers with real time seating and ticket availability along with payment processing so that tickets could be bought online. Perhaps the biggest challenge was making the site easily accessible for customers wanting to check availability and make bookings using their smartphones or tablets – technology that was a recent addition to peoples’ households, and pockets. 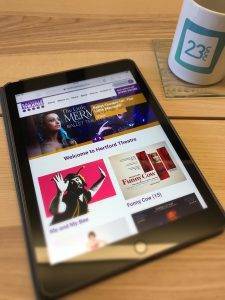 Using those same programming languages, Hertford Theatre became our first responsive website design. We created a site that adapted to the device it was being viewed on, but retained its functionality, meaning customers could check availability and make bookings wherever they were. Five years further on, and the boundaries of web development continue to be pushed, giving programmers like Matt here at 23ccc a lot more tools at his disposal to create ever more visually appealing and multifunctional websites. 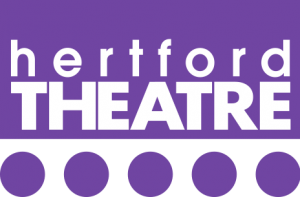 The latest update to the Hertford Theatre site, which went live in Spring 2018 has allowed us to freshen up the design of the site. We have made better use of the screen real estate and included videos in the event details and reviews sections. We were also able to integrate with Ticketsolve, the new box office system being used by Hertford Theatre.